Cat is a regular contributor to radio, TV and printed media in support of her community work, her commitment to youth employment and Apprenticeships and as a representative of local businesses. Trained in media relations, Cat has been interviewed on local radio regarding Apprenticeships and the ‘Shop Front Improvement’ scheme in Thame. 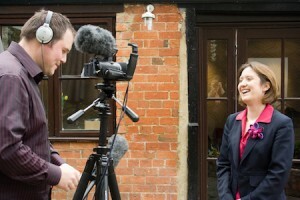 She has appeared on local TV reporting on the success of the economic development projects she and 21st Century Thame delivered throughout the Oxfordshire market town. She has appeared in, and been quoted on, many print media articles, some of which are listed below. Always willing to help, Cat has provided Video testimonials for companies, including this one for the accounts system used by STW, Kashflow.